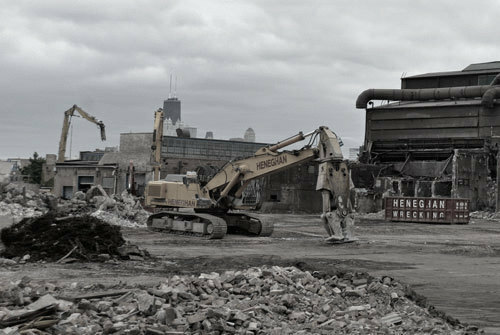 Heneghan Wrecking & Excavating | Demolition Chicago IL. Wacker Drive | Chicago IL. Former Harpo Studios | 11O N. Carpenter | Chicago, IL. Heneghan Wrecking Company is a family owned and operated business that has been providing complete demolition services in the Chicagoland area for over 40 years. Throughout this time, we’ve earned a reputation for quality work, customer satisfaction and safety, providing turnkey demolition services for commercial and industrial large-scale properties. We will guide you in your project from beginning to end and offer highly managed stewardship in all phases. We are a fully licensed, bonded and insured demolition company, with a bonding capacity over $35 million. 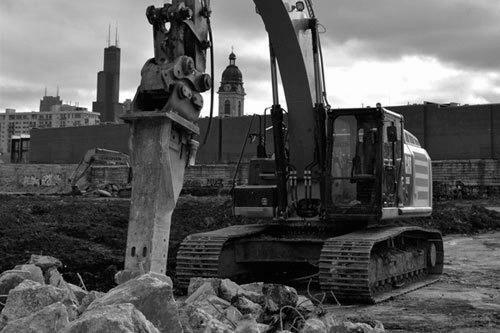 We have the experience of demolishing complex structures throughout Chicago in high density areas for local developers and general contractors. Our comprehensive insurance includes liability coverage with pollution coverage. We have the resources to remove structures of all sizes with our state of the art equipment. We are an active member of the National Demolition Association and keep up with all best practices. Safety is first and foremost on our minds whenever we begin a demolition job. That is why we enforce strict safety standards every step of the way. We have daily toolbox meetings to review work conditions and safety requirements, and our crews regularly attend classes to stay current on OSHA rules. Each employee is equipped with Personal Protective Equipment that incudes, at a minimum, a reflective vest, safety glasses and hard hat. Some of the safety courses our staff has trained. 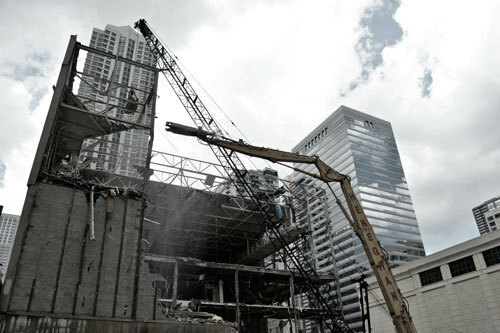 At Heneghan Wrecking we focus on total demolition and select structural demolition projects in the Chicagoland and NW Indiana areas, most smaller demolition projects aren’t suited to our business. We’ve done large projects around the city in the commercial, transportation, industrial, and healthcare industries, to view some of our past projects please click the above image, we’ve been Chicago’s premier demolition contractor for years, you may view a partial client list here. We enforce safety standards on each and every demolition project. This includes daily meetings where we review work conditions and safety requirements. Our crews also stay current on OSHA rules through regular attendance of daily safety classes. We are partnered with a 3rd party safety firm to audit our jobsites and provide regular training on current and ongoing safety topics in the industry. Before the demolition of a structure, we can manage your remediation needs including asbestos removal, refrigerant recovery, universal waste removal, and post demo UST (underground storage tank) removal. We adhere to all EPA requirements, including notifications. Heneghan Wrecking & Excavating has comprehensive insurance coverage including $10 million in liability with an A X carrier and $5 million in pollution insurance with an A XV carrier. We commit to our demolition clients that we will maintain up-to-date policies on subcontractors while on our assignments. This service is the complete dismantlement of the interior and exterior of a structure. After the structural demolition of a building, we haul away the materials and leave the property clean to move on to its next phase. Or materials may be recycled on-site and put to use for a new structure, if required. We are happy to consult on your options. There are situations where a customer may want to preserve the exterior of a building or have a major renovatation and perform interior demolition. This has become a popular service due to the increase of landmarks throughout Chicago. When a structure has a historical exterior that must be preserved this is your service option. Heneghan Wrecking Co. has experience in on site recycling; utilizing concrete crushers on the job site. We are consistently exceeding the City of Chicago’s 50% recycling ordinance and in addition can assist in decreased hauling by recycling on your jobsite which will provide backfill for the new development. Heneghan Wrecking & Excavating focuses on commercial and industrial projects, not residential demolition. Thank you for your inquiries.